Every year for Christmas my family and friends have a tradition of making a new Christmas Tree Ornament for decorating or gifting. 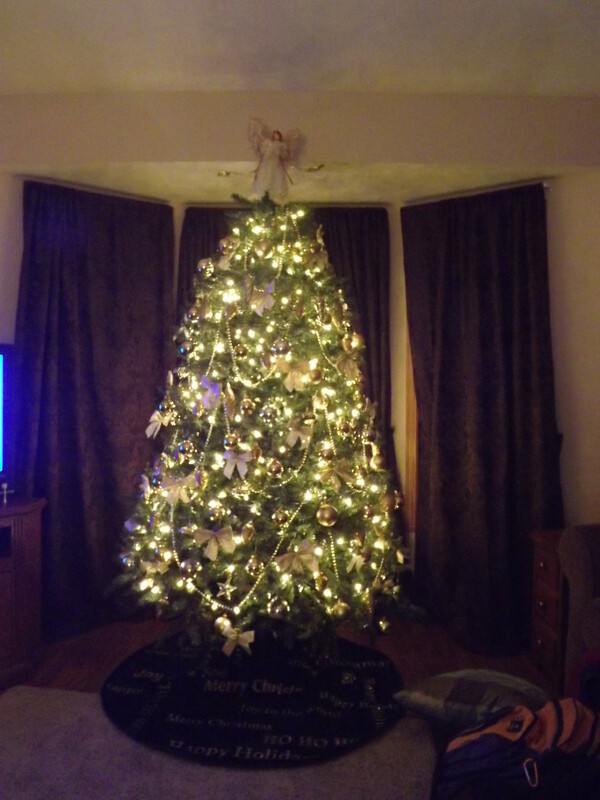 It's been a wonderful tradition that has filled our lives and our Christmas tree with so many wonderful memories. I usually aim for a simple project that can be finished quickly and easily and yet is still unique. 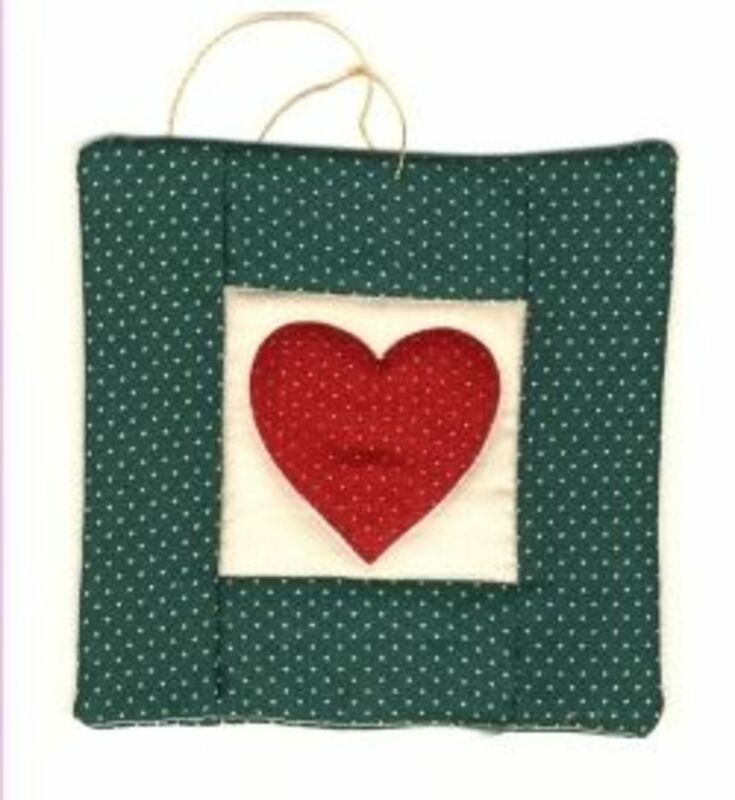 This quilted heart ornament was my and my husband's project one year. I've no experience with quilting but these little guys are simple enough that anyone can do them. 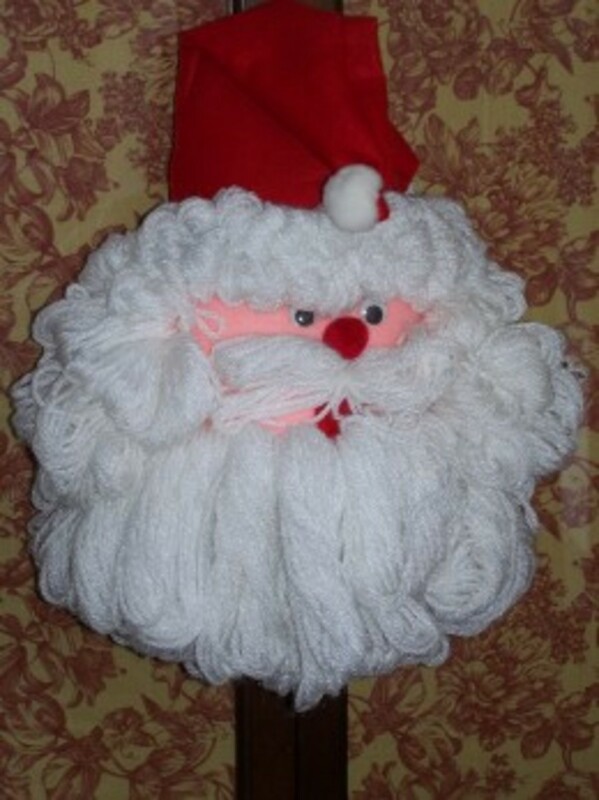 They are cute and festive and bring the feel of earlier and simpler times to your Christmas tree. Even if you aren't an experienced quilter, these cute little holiday ornaments can be stitched up hand for an even more handmade look. You only need a few simple items which you most likely you already have in your sewing room. gold or red thread for hanging. 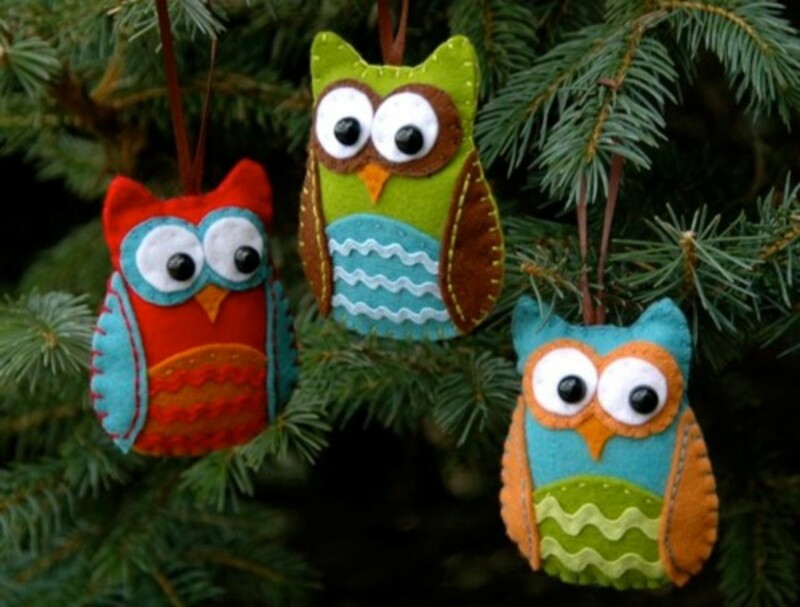 Do You Like To Make Your Own Christmas Ornaments? Yes, I do so often. Occasionally when I'm feeling festive. 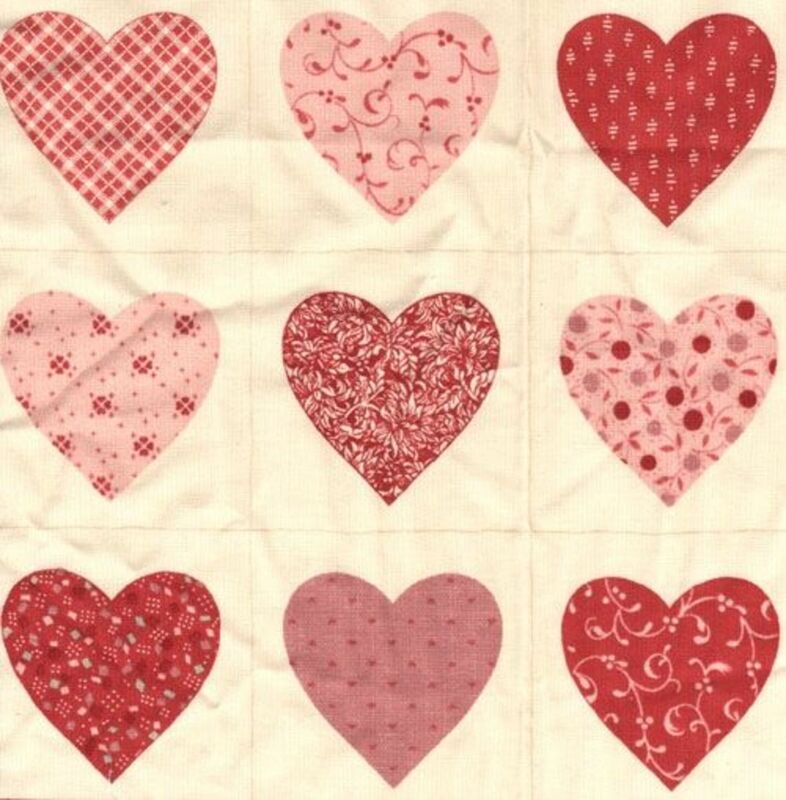 I chose these hearts because I liked it's simplicity as well as all the heart color variations the fabric gave me. But there are all sorts of fabric possibilities depending on what you'd like to be in the center of your Quilt Christmas Tree Ornament. Explore all the various Christmas fabrics and select something that suits you or whoever your gifting it to. Select A Simple Patterned Fabric For Your Christmas Ornament's Border - I used a green polka fabric for my Christmas ornament's border. Select A Fabric For The Backside Of Your Christmas Tree Ornaments - I used a cream colored cotton to match the front of the Christmas ornament. I chose an off white that matched the off white area surrounding the hearts. Personally I liked the white color. You could just as easily use the border fabric or something completely different. And if you're feeling extra artsy you can always make matching hearts on both sides of the Christmas tree ornaments. Cut the centers, borders and back of your Christmas ornaments. Using the heart fabric shown above we cut the various heart squares out. Border strip (2 per ornament) 1 1/4 wide x 4 1/2 inches long. NOTE: We didn't use any batting materials to add puffiness for these ornaments. They really didn't need it but there's no real reason not to if you want them extra puffy. For the larger size we simply sewed the border farther away from the heart design and made the border strips 2 inches wide. Doing this means you need to cut you back piece 6 inches. For years I cut everything with a really good pair of scissors. While this is still a available way for your ornament sewing, but for the nature of these ornaments a rotary cutter works really well. Particularly for the border strips and back fabric. Pretty much anything requiring a straight line. 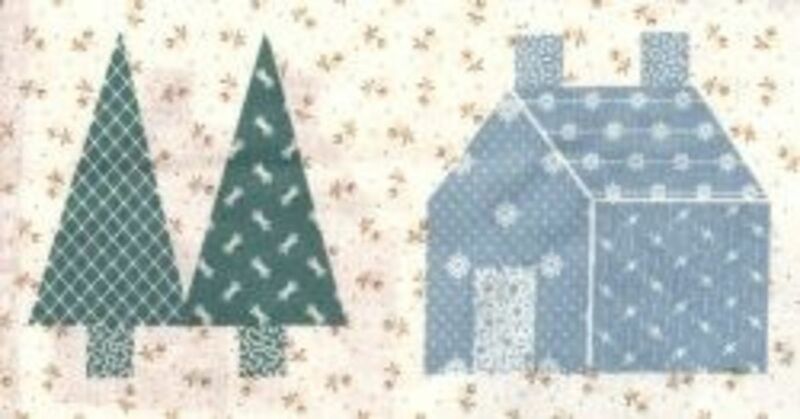 * Sew a 1 1/4 x 2 1/2 border strip to both the top and bottom of your ornament. * Press seams over to the darker border strips so it doesn't show through the lighter colored center piece. * Sew a 1 1/4 x 4 1/2 strip to both left and right sides of ornaments. * Again press seams over to the borders side. You now have a completely quilt block. 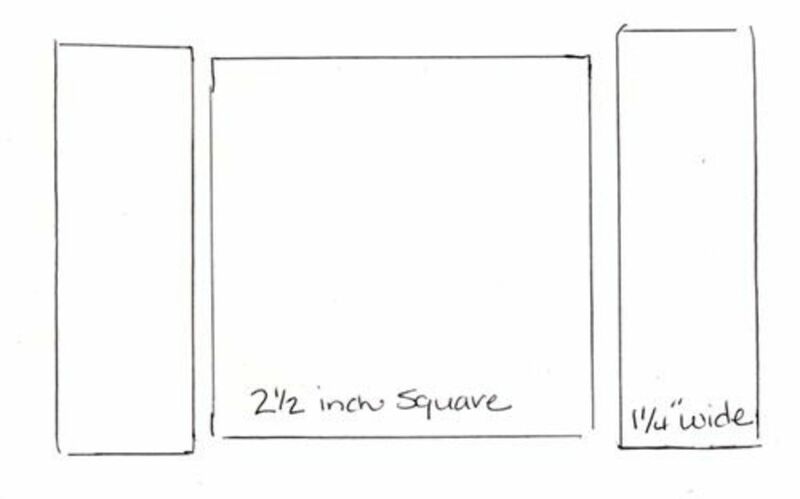 * Place quilt block face down onto backer fabric and stitch 3 sides. * Leave the entire bottom of the Christmas ornament open to make the turning process easier. * Tuck the seam allowance into the ornament and carefully sew shut. NOTE: The eraser end of a pencil often comes in handy for poking out the corners of your Christmas Tree Ornament. Photo Right Shows front and back of ornament to better showcase the quilt stitching. 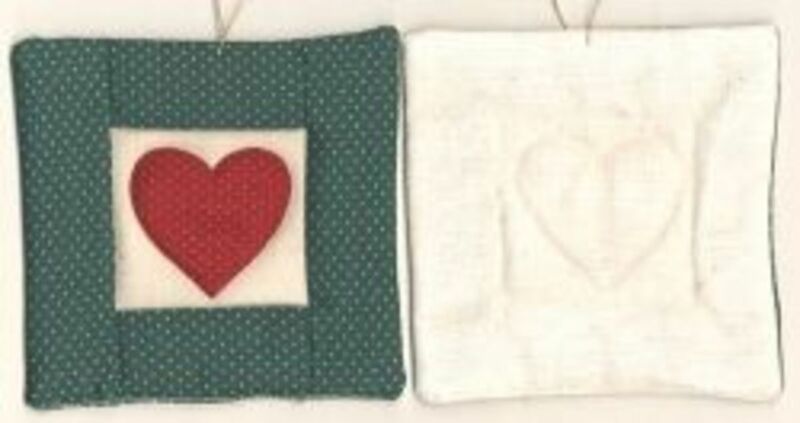 * Stitch In The Ditch (the seams of the quilt block square) and then stitch around the heart shape. On the smaller Christmas Tree Ornament the green border which is attached close to the heart. 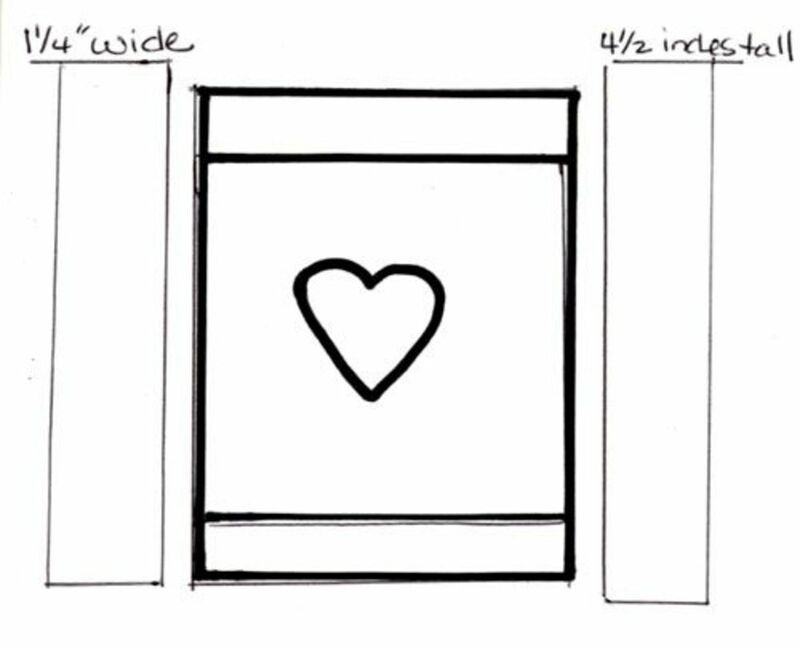 A heart shape is stitched inside the heart by about 1/4 inch and then stitched in the square shape around the heart in the seam. 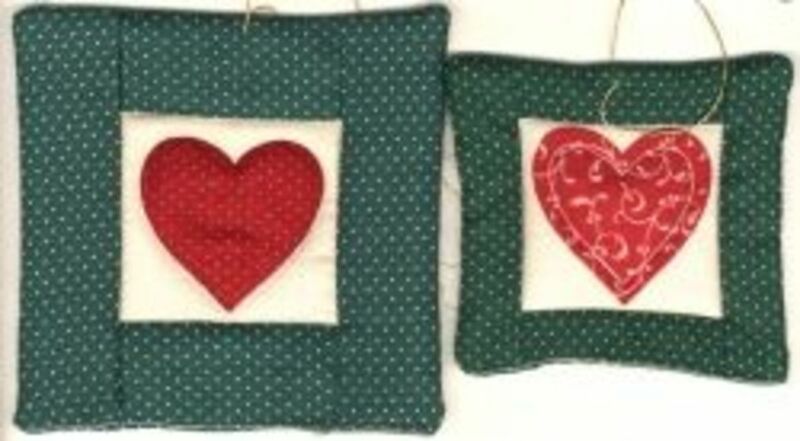 On the large Christmas Tree Ornament the green border is spaced away from the heart and the border is cut slightly wider. This ornament is stitched around the edge of the heart and then the inside seem of the border. 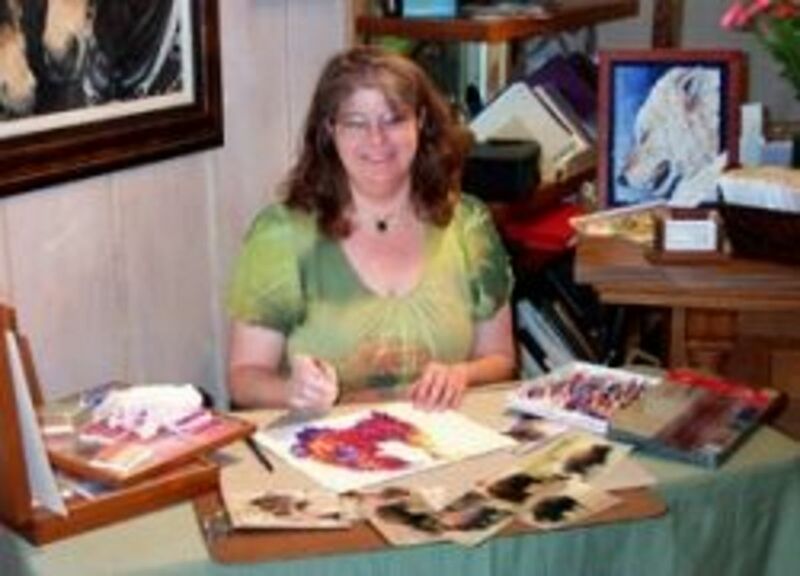 Mona Majorowicz demonstrating at Side Street gallery during open house. These are very pretty and look like they'd be easy and quick to make. Ohhhh I really love these quilted ornaments, great tutorial again. Do you ever get a chance to paint anymore? You are always so busy :) Angel Blessed, for the Christmas Quest! Great job on the directions. I am not a novice but these are simple enough for beginners. Angel belssed. This looks like a great project to use up some of my materials stashed in the craft closet. Excellent directions and photos. Very cute little project, I like it. 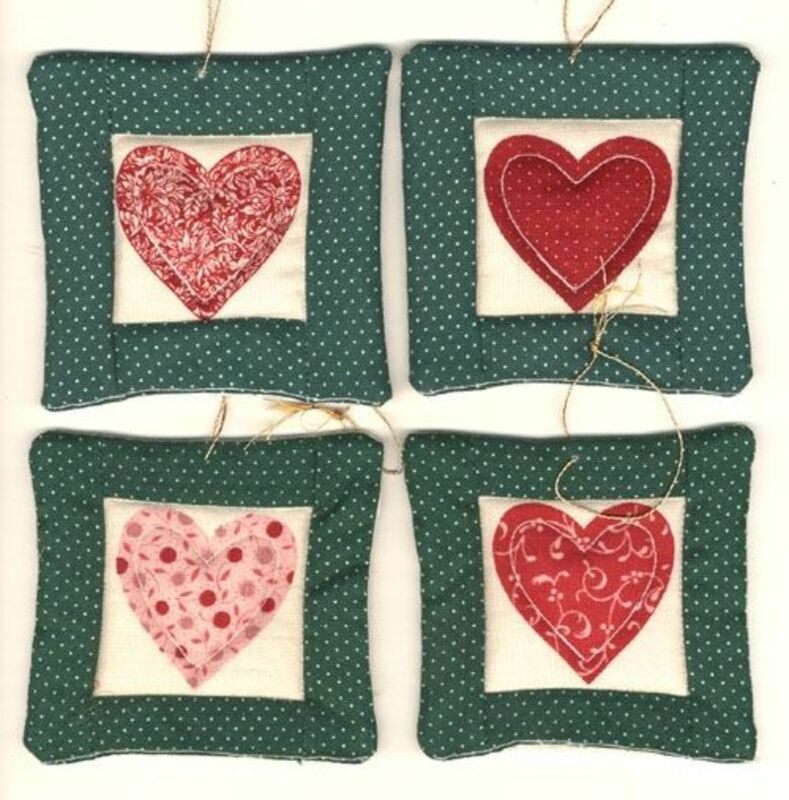 These look like great ways to use up fabric and cute ideas for church craft sale gifts. Congrats on being part of the Great Ideas for Christmas Crafts list! Very nice page! I think hearts are always good for any occasion. Love these for the tree, very nice! !